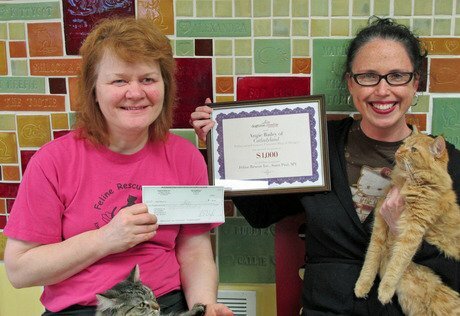 CatTime is thrilled to support Feline Rescue, Inc., recipient of a DogTime Media donation as chosen by Petties winner Angie Bailey. Feline Rescue was created in 1997 by a group of people who had worked with another cat rescue organization that folded. The founders were committed to creating support and rescue for cats that was “no-kill” – would only euthanize when a cat was injured or ill and beyond medical treatment. They wanted to offer both a shelter and foster care for stray, abandoned, or abused cats. They wanted to offer a respectful alternative to traditional animal “control” and save cats’ lives. Our mission is to provide safe shelter, veterinary care, and socialization for stray, abandoned, or abused cats until good permanent homes can be found for them. Our mission does not enable us to accept owner surrendered animals. Feline Rescue believes that all cats are entitled to a safe, caring, and happy home. We are firmly opposed to the practice of declawing, considering it cruelty to animals, and an unethical practice. We believe that all tamed cats should be kept indoors. No cat in our care will be destroyed except when suffering and beyond medical treatment, and the cost of the medical care shall not be a factor in this decision. The Twin Cities communities know Feline Rescue as a key place, if not the place, where a homeless or abandoned cat will find safety. People call us about stray adult cats. Most people will care for them until we have a space to take them in. People also call us about mom cats with kittens, injured cats, and other urgent situations. Our intake people find a place at our shelter or in foster care for these cats until they are ready for adoption. In recent years, Feline Rescue has had numerous “foreclosure kitties.” Realtors, bank representatives, and landlords contact us with cats left behind, as do neighbors. Our outreach volunteers find friendly, domesticated cats living with feral colonies. We receive some cats when their person dies or must move to assisted living that does not accept pets. We do not accept cats from people who just don’t want them any more. Instead, we will try to help find a way for the people to keep them. And, unfortunately, we receive some cats and kittens because people “dump” them on our doorstep. Somehave sad notes. “My daddy lost his home; now I am homeless, too.” On occasion, our volunteers will also rescue cats from overcrowded public shelters that euthanize. Kittens, moms with kittens, and pregnant cats go immediately to one of our foster homes where they receive the watchful care and socializing that young and nursing cats require. The kittens are raised until they are old enough to be spayed or neutered. The moms are also spayed once they no longer have dependent kittens. These foster cats then become available for adoption. Adult cats come into our shelter where they go to our Intake suite for 14 days to make sure they have no communicable diseases. They are also tested for feline immunodeficiency virus and feline leukemia. They are also spayed or neutered. All cats receive as well any other medical care that is needed. After the 14 days of isolation, adult cats join the shelter community. At first, they are confined to kennels except when our socializing volunteers are working with them to see “how they feel” about other cats. Once it’s determined that a new cat would rather be with other cats than be confined – a few don’t, he or she becomes a “roamer.” A roamer has a suite in which she or he lives with as many as 15 or 20 other cats. Each also has a kennel into which to retreat. In the suites, the cats have toys, blankets, perches, windows to look out of, food, water, and litter boxes and humans that come in twice a day to clean boxes, provide food, and do a bit of cuddling. Both foster and shelter cats available for adoption are posted on our web site, on Petfinders, and a couple of other web sites. Each cat has pictures andhis/her story as told to our volunteer cat journalist. People come to the shelter to meet and adopt cats during our open hours. Many of the adopters keep us updated with pictures and cards, so our family of cats and people continues long after rescue. Elmo was found injured on the side of a road by a Good Samaritan who brought him to Feline Rescue. His hips were broken, along with a leg. As the blog tells, he had successful surgery but was embarrassed by the loss of his pants. So undignified for a proud cat. Feline Rescue volunteers kicked in money for his medical care, and his foster family made sure he did his physical therapy. He was adopted several months later, all healed, and not traveling under the name “Sad Boy” any more, as he was when he arrived. Another story that captures, I think, the best of Feline Rescue. Feline Rescue believes that cats with FIV and FeLV can still live nine happy, safe lives. We have a special suite for FIV cats at our shelter, so they, too, have friends and playmates. This is Lobo, one of our FIV fellows (most of them seem to be guy cats) who was lovingly adopted last spring. 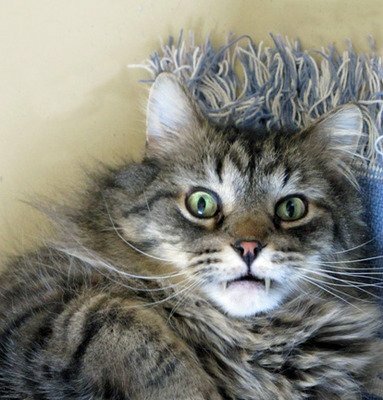 While he was staying at Feline Rescue’s hotel, however, he got into watching vampire movies – the Twilight series, etc. Inspired by the work of Feline Rescue, Inc.? Consider volunteering or making a donation to their organization.